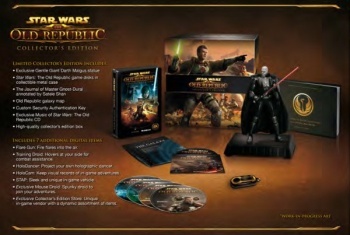 According to supposedly leaked information, BioWare thinks its The Old Republic collectors' edition is worth a very hefty price tag. Polish retailer Empik.com may have let the cat out of the bag when it came to Star Wars: The Old Republic announcements that EA and BioWare were saving for this weekend's San Diego Comic-Con. In addition to information about the game's preorder benefits and box art, however, Empik also revealed the many, many goodies that are included in the (inevitable) Collectors' Edition of the game. According to Empik.com, the Collectors' Edition clocked in at €150 - about $212 at current exchange rates. That's extremely expensive for a limited edition, above even the (then-lampooned) $150 for Modern Warfare 2's Prestige Edition. On the other hand, of course, it seems like the EU always gets screwed in the price point, so who knows what the US retail price will be? Price point aside, it seems like a fairly standard MMO limited edition, though some of the digital goodies worry me as a long-time MMO player. I'm going to assume that the Training Droid won't be a crucial addition to combat, and presumably there will be equivalents to the HoloCam (even if it's just using an external program like Fraps) - but the idea of a "unique in-game vendor" sounds a bit troublesome. As always, none of this information is confirmed, no matter how official the image here might look. One way or another, we'll likely get the official word this weekend at Comic-Con.